I've finally got round to putting a few new resources online. They're things that people have asked me for copies of before, so I hope they'll be useful to others as well. I had put off putting them online before in the vain hope of having time to make some revisions and make some improvements, but, as I've realised I won't have time to do that any time soon, I thought I'd put them up as they are as they may still be of use. The Doctrine of the Application of Salvation - 40 pages on soteriology originally prepared as a course book for students on Leading Together in Swansea last year. It covers Grace, Regeneration, Faith & Repentance, Justification, Sanctification and the possibility of falling from grace. So, as you can see, it doesn't by any means cover the whole of soteriology, and even the areas it does cover aren't complete (as it was a supplement to the classes I taught). But some of it might possibly be helpful. I'd read it in conjunction with the recent posts here about what grace isn't, what grace is, faith and repentance. 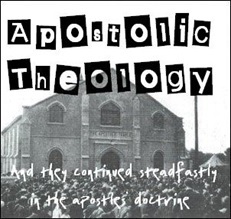 'And He Gave Some Apostles': A Theology of Apostleship - this was my MTh dissertation, which up to now I've somehow been quite secretive about (I've normally only given it to people who have asked for it multiple times). Partly that's because I'd like to rewrite portions, nuance some aspects, and clarify a few things. 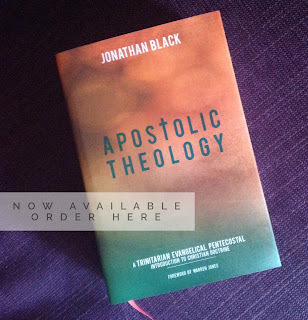 Yet despite that, it's actually not that bad a read, and may be useful particularly within the Apostolic Church; after all, we don't really have many systematic treatments of apostleship available from an Apostolic perspective these days. Theology of Prayer - these are some very brief summary notes from a seminar I gave at the 2012 Prayer Works conference in Easington Lane. Different people have asked for a recording or notes of the seminar, but it wasn't recorded, and I don't have very full notes from my talk, but the essence is here in a two page summary. It looks at Prayer and the Trinity, Prayer and the Gospel, and Prayer as Communion with the Triune God. You might also be interested in How Jesus Frees us for the Prayer Meeting. All these, as well as a paper on ecclesiology and the Lord's Supper which was already there, can be found here. I'll probably add a few more things there in the near future too.